Dare to Compare – Could the End of QE Crash Stocks Like in 2010 and 2011? The S&P 500 dropped 17% right after QE1 ended and 20% right after QE2 ran out? Will stocks crash again now that QE3 and QE4 have been completed? Here is the only visual QE history chart along with an unexpected conclusion. QE1 ended on March 31, 2010. Shortly thereafter the S&P 500 dropped as much as 17.12%. QE2 ended on June 20, 2011. Shortly thereafter the S&P 500 dropped as much as 20.76%. Fed officials are expected to end asset purchases (QE3 and QE4) at the next FOMC meeting on October 28-29. Will stocks crater like they did in 2010 and 2011? QE1 started in December 2008 with $660 billion, was expanded by $1,050 billion in March 2009, and ended in March 2010. QE2’s $600 billion asset purchase injection started in November 2010 and lasted until June 2011. QE3 started in September 2012 at a rate of $40 billion per month. QE4 started in December 2012 at a rate of $45 billion per month. Starting in January 2014, QE3 and QE4 have been reduced gradually by $5 billion per month. QE3 and QE4 have already been wound down to combined monthly purchases of $15 billion, and Fed officials said they expect to end asset purchases after the October 28-29 meeting. Will the QE3 and QE4 withdrawal shock the system (aka stock market) as QE1 and QE2 did? I’m a visual person and find that a picture (or chart) really says more than a thousand words. Here is a simple, visual explanation of the various QE programs. 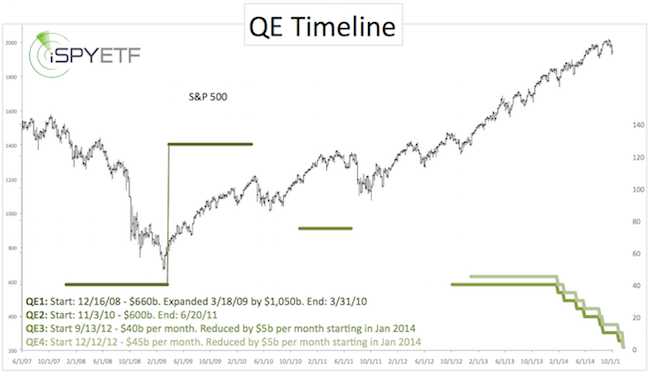 This is the only QE history chart on the web, and was originally published in the October 5 Profit Radar Report. QE1, QE2, QE3 and QE4 are illustrated by various shades of green, because green is the color of money (chart courtesy of the Profit Radar Report). Illustrated are the monthly dollar purchases. Exact monthly asset purchase data for QE1 and QE2 is not readily available, so the amounts shown are based on total committed funds divided by the number of months the program was in effect. 1) The asset purchases under QE1 and QE2 were more significant than the asset purchases under QE3 and QE4. 2) QE1 and QE2 stopped cold turkey. The Federal Reserve obviously learned from the almost instant S&P 500 (NYSEArca: SPY) selloffs and equipped QE3 and QE4 with the ‘taper’. Purely theoretical, the actual end of QE3 and QE4 could be a non-event, and should be much less noticeable than the end of QE1 and QE2. Why Did the S&P 500 Just Lose 200 Points? But, if that’s the case, why did the S&P 500 just lose as much as 200 points? Investors may have simply sold stocks in anticipation of QE ending. Sometimes it’s all about mind of matter. If investors mind (that QE is ending) it matters, at least temporarily. In addition, the Dow Jones reached an important technical resistance level on September 17. 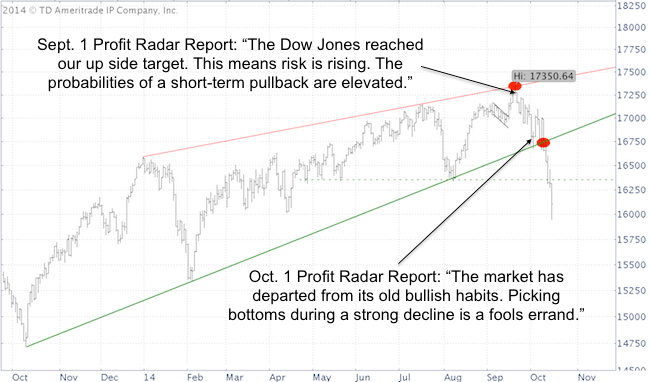 The Profit Radar Report predicted that this resistance level would increase the risk of a correction. It is undeniable that the various QE programs have driven asset prices higher. It would be intuitive to conclude that the absence of QE (at least sterilized QE) will send stocks lower. But the stock market is not always intuitive and doesn’t conform to investors’ expectations. In summary, I wouldn’t sell stocks just because QE is ending. Overnight, four iconic U.S. companies lost 49%. One of them, a reputable blue chip Dow component, wiped out four years worth of gains while investors were sleeping. What does this performance mean and can it be detected/avoided? The biggest danger is one you are not aware of or can’t predict. For individual stock investors that’s gap down opens. Such overnight losses leave big chart gaps that often by-pass stop-loss orders. October has been a particularly treacherous month as four iconic U.S. companies lost a combined 49% while shareholders were sleeping. Talk about a financial overnight coronary event. In the night(s) from October 17 (Friday) to October 20, IBM (NYSE: IBM) lost 8.35% and wiped out four years of gains. In the night from October 20 to 21, Coca Cola (NYSE: KO) lost 5.75%. In the night from October 23 to 24, Amazon (Nasdaq: AMZN) lost 9.10%. In the night from October 15 to 16, Netflix (Nasdaq: NFLX) lost 25.83%. Is there a common trigger for all those coronary events? Is it possible to detect and prevent owning stocks before an overnight collapse? 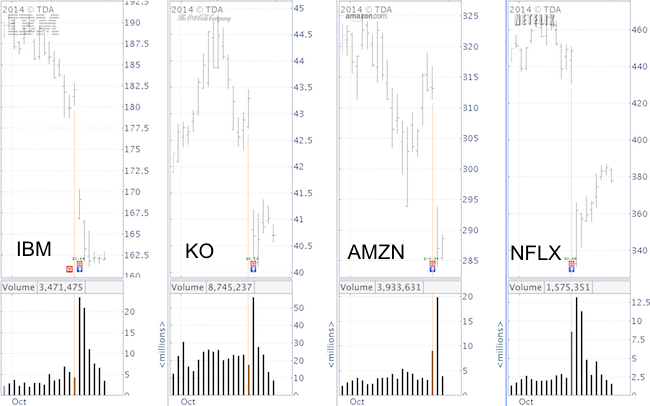 The chart below shows IBM, KO, AMZN and NFLX side by side. Trading volume spiked every time on the day of the coronary, but there was no consistent pattern the day before (which was the last day to get out in time). A look at commonly used technical indicators – such as moving averages, MACD, RSI, percentR – also shows no consistent pattern. Netflix and Amazon were unable to overcome their 20-day SMAs the days prior to the gap down, but Coca Cola ‘slept’ above the 20-day SMA the night before it fell out of bed. Amazon triggered an MACD buy signal the day before it tumbled. The only way to avoid individual meltdowns is to invest in baskets of stocks via ETFs or other index-based vehicles. The link below discusses which type of ETFs are best in this stage of a bull market. There is, however, one common denominator, indicated by the little telephone icon. All companies reported their earnings just before the big gap down (either after the close or before the bell). Do Gap Downs Foreshadow a Major Market Top? Excessive amounts of selling pressure are a reflection of investor psychology. Gap ups on the way up are a vote of confidence; gap downs show that investors’ confidence is eroding. Erosion of confidence is one of the tell tale signs of an aging bull market. This doesn’t mean the bull market is over, but it shows that investors are becoming more selective. The number of outperforming stocks shrinks as more and more individual stocks fall into their very own bear market. In fact, currently 31% of all NYSE stocks are trading 20% or more below their highs. In other words, a third of all stocks are already in their own individual bear market. A historic analysis of major market tops puts this deterioration into perspective and shows how close (or far off) we are from a major market top. It also shows which sector is the best to invest in right now. Here is a detailed look at the 3 stages of a dying bull market. Bears finally got 18 days of hope as the S&P 500 lost as much as 9.8% and expectations of the long-awaited market crash seemed to finally pan out. However, this may be just a cruel déjà vu. Here’s a chart that should scare every bear. People often look for strength in numbers, but on Wall Street, ‘strength in numbers’ – also known as crowd behavior – tends to backfire. Here is a look at one interesting chart. The chart plots the S&P 500 against the average exposure to US equity markets reported by members of the National Association of Active Investment Managers (NAAIM). I’m a chart and numbers guy, but the message of this chart is probably more powerful if we emphasize the emotions behind the numbers, rather than just the numbers. Last week, active money managers slashed their US equity exposure to 9.97%, the lowest reading since September 28, 2011. In 2011, the S&P 500 fell as much as 21%. Last week money managers bailed before the S&P even lost 10%. They flat out panicked. 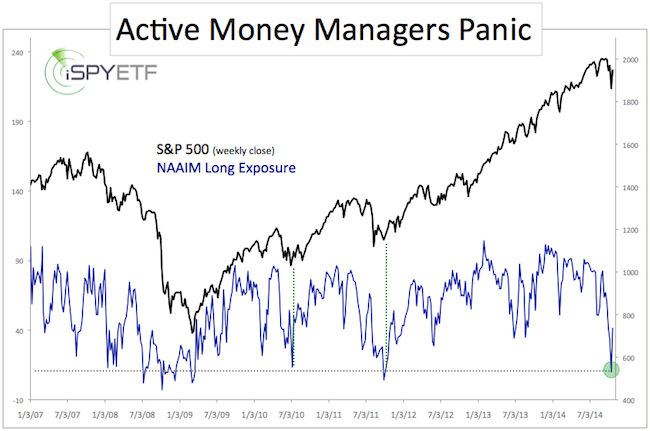 Why did money managers panic? Were they right to panic? The level of panic seen at the October 15 low was enough to propel the S&P as much as 140 points. Was their panic justified? In other words, despite this bounce, did the ‘big bad bear market’ start at the September highs? Has the “Big Bad Bear Market’ Started? Sure, there are plenty of reasons why stocks should roll over, but a watched pot doesn’t boil. Bear markets are rarely anticipated by the masses. There are also persuasive reasons why this bull market has more time left. We just discussed one. Another is bullish seasonality and the absence of the most reliable bear market trigger I’m aware of. 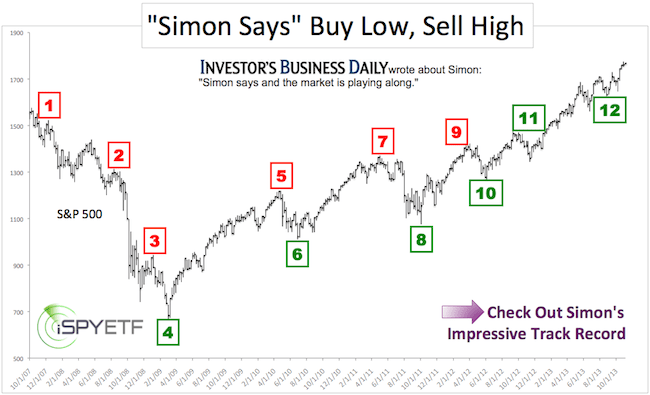 After extensive research, I found an indicator that correctly warned of the 1987, 2000 and 2007 tops, and at the same time projected new highs in 2010, 2011, 2012 and 2013. More details here. It is possible that the October panic lows will be tested once more, but the weight of evidence suggests that the bull market is not yet over. Short-term, the S&P 500 and Dow Jones are bumping against important resistance levels. A move above those levels is needed to unlock higher targets. Ouch, that hurt! Dow Theory expert considered the bull market in tact right before the Dow Jones and Dow Jones Transportation average shed 10%. Here is one theory that Dow Theory just shattered. The analysis and the Dow Theory interpretation was not wrong per say, but the timing was terrible. The article was published on September 17, and followed by an 11% drop in the Dow Jones Transportation Average. No indicator is perfect, but an outright bullish assessment or signal prior to a double-digit selloff is worth examining. 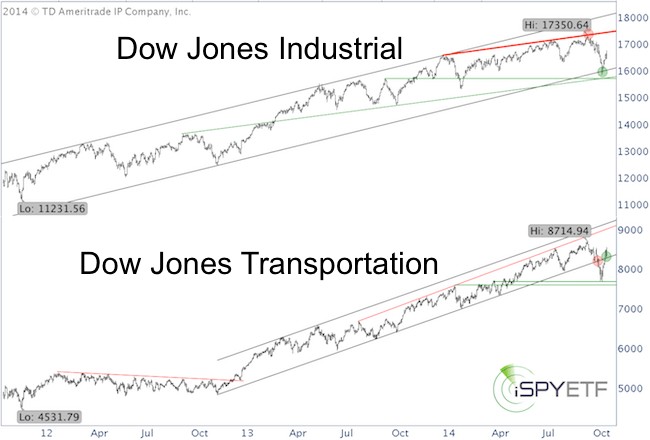 The chart below enhances the Dow Jones Industrial Average and Dow Jones Transportation average with a few simple trend lines. The ensuing selloff drew the Dow Jones Transportation Average well below a strong 2-year trend channel. Although bearish, it wasn’t time to panic, because both averages confirmed the September 19 high. There was no bearish Dow Theory divergence at the top. Dow Theory is the Grand Daddy of market trend analysis and I’m not about to discredit it, however, no indicator should ever be viewed in isolation. Dow Theory still suggests the bull market is in tact – which harmonizes with my research – but that doesn’t mean investors need to accept a 10% drawdown. The bounce from the October low brought the Dow Jones back up to key resistance (not shown on chart, resistance available to subscribers of the Profit Radar Report). A move above this resistance is needed to confirm this bounce. As with any long-term indicator, additional indicators can be used to prune long-term portfolios via better-timed sells and buys. Last week saw the highest amount of selling climaxes since October 2011. Happy bulls and frustrated bears remember that October 2011 marked a major low. What does last week’s record number of selling climaxes mean? A selling climax happens when a stock/index or ETF drops to a 12-month low, but bounces back and closes the week with a gain. There were 605 selling climaxes last week; the Russell 2000 was one of them (more details here: Will Bullish Russell 2000 Signals Last?). As the chart above shows, the last time there were more than 500 selling climaxes was the week ending October 7, 2011, when over 1,350 stocks saw a bullish reversal from a 52-week low. Many happy bulls and frustrated bears will likely remember that the S&P 500 hit a major bottom on October 4, 2011. The problem with weekly climax data is the time delay. By the time Investors Intelligence reported last week’s climaxes, the S&P 500 was already 70 points above its low. A closer look at the Russell 2000 chart shows that, although the spike in buying climaxes is net bullish, stocks are not out of the woods yet. Here’s a look at the Russell 2000: Bullish Russell 2000 Signals – Will They Last? Bullish Russell 2000 Signals – Will They Last? The Russell 2000 has weighted down the broad stock market since March. Now, for the first time in a while, the Russell 2000 is actually outperforming large cap stocks. Does that mean that small caps will lead the market higher? The Russell 2000 is showing signs of life, after months of underperformance relative to the S&P 500. The Russell 2000 is one of the only indexes (along with the MidCap 400) that painted a green reversal candle (see chart insert). Prior to erasing last week’s losses, the Russell 2000 also dipped to a 52-week low. A weekly reversal after a 52-week low is also considered a selling climax. 605 stocks recorded selling climaxes last week. This is the highest count of selling climaxes since October 2011, which marked a major bottom (more details here: Selling Climaxes Soar to 4-year High). 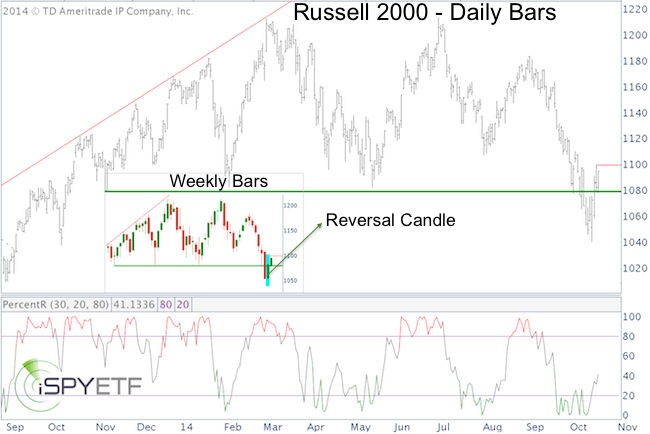 Bullish: Last week’s green reversal candle pushed the Russell 2000 back above support at 1,080. Almost Confirmed: The chart below shows one indicator I like to monitor when it comes to spotting trend changes. On the short-term daily chart, this indicator requires a close above Friday’s high. The same is true for the weekly chart. Confirmation Needed: The IWM:IWB ratio shows the performance of small caps (IWM Russell 2000 ETF) relative to large caps (IWB Russell 1000 ETF). 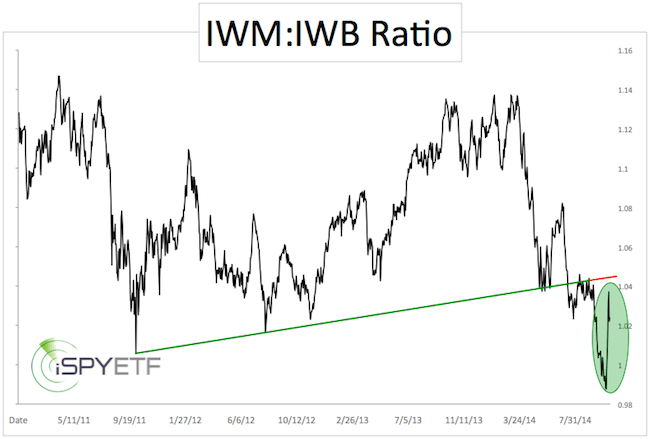 The IWM:IWB ratio is about to test prior support, now resistance. Unless the ratio can move above 1.05, small caps are likely to continue underperforming their large cap cousins. In short, the Russell 2000 is showing strength, and odds of continued up side are increasing. Stocks in Freefall! Is this the Beginning of the End? An avalanche of analysts and market ‘pros’ predicted a stock market crash in May and June. Here we are, almost half a year later. Is this the crash predicted by so many, or is it just another temporary correction? Pardon the sensationalistic touch of this headline, but ‘is this the beginning of the end?’ is a perfectly legitimate question. Not because I’m a fear monger, but because others are. Although the S&P 500 gained as much as 200 points since those crash prophecies first surfaced, investors now wonder if this is the ‘big one.’ Is this the time when crash prophesies turn into reality? A Market Top or THE Market Top? Obviously, the September 19 highs carry some importance, after all the S&P 500 and Dow Jones lost about 8% since. Perhaps looking at what caused this spirited selloff may help determine if September 19 is ‘A’ market top or ‘THE’ market top. 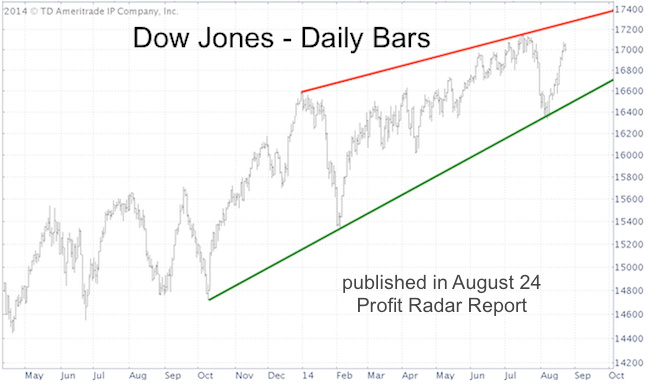 On September 19, the wedge resistance line was at 17,350, which marked the exact top of the Dow Jones. Based on the Dow’s performance, the wedge pattern is valid. The textbook down side target for a bearish wedge is its origin, which is around 15,000. One near-term down side target, identified by the October 10 Profit Radar Report, is 1,850. The S&P hit 1,850 this morning, and every time a target is met a bounce becomes likely. Nevertheless, today’s low doesn’t display the marks of a sustainable low yet. Stocks are oversold, but sentiment is not extremely bearish. 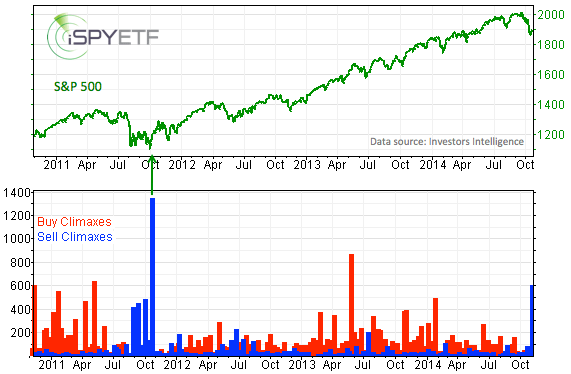 Throughout 2013 and 2014 the S&P 500 rallied as soon as it hit an oversold condition. The October 1 Profit Radar Report warned that this time might be different, as some of the biggest declines happen when stocks don’t bounce from oversold conditions. VIX seasonality is approaching a significant seasonal high. S&P 500 seasonality is turning positive in the near future (detailed VIX and S&P 500 seasonality charts are available to subscribers of the Profit Radar Report). Seasonality doesn’t preclude further losses, but appears strong enough to eventually erase all or most of the losses accrued recently. Based on the Dow’s wedge formation/target, a 13% decline is possible. However, seasonality may cushion the down side risk. This decline appears similar to the 2010 and 2011 corrections. I personally will be looking for a specific bottoming pattern (displayed at the 2010 and 2011 lows). The actual down side price target is somewhat fluid (the specific bottoming pattern is discussed in the Profit Radar Report). Once the bottoming pattern starts developing, we should be able to identify a key support level. No doubt, the above-mentioned crash prophets are getting to enjoy their 15 minutes of fame, but the only indicator that actually predicted the 1987, 2000 and 2007 crash suggests that bulls will stage a comeback once this selloff is exhausted. Here is a close look at this impressive indicator.